The small fortress was built at the same time as the large fortress (1780-1790) as part of the Austro-Hungarian border defenses against Prussia. Almost from the beginning the small fortress was used as a prison, holding deserters and other military offenders, including prisoners from the armed uprisings of 1848. The most famous inmate was Gavrilo Princip, the Serb nationalist who assassinated Archduke Franz Ferdinand in Sarajevo and sparked WWI. Following the annexation of the Czech lands by Hitler’s Germany in the lead up to WWII, the prison in the small fortress began housing enemies of the Nazi regime; at first Jews and Gypsies from across the third Reich and later Partisans (Czech resistance fighters) and members of the illegal communist party. From June 1940 until the end of the war the small fortress prison was run by the Gestapo, and more than 32000 prisoners including 5000 women passed through its gates. For most, Terezín was a stop on the way to the other Nazi prisons or concentration camps in which they would perish, but thousands also died in the prison from a combination of overwork, undernourishment, disease and direct brutality at the hands of the guards, many of whom were later convicted of war crimes. 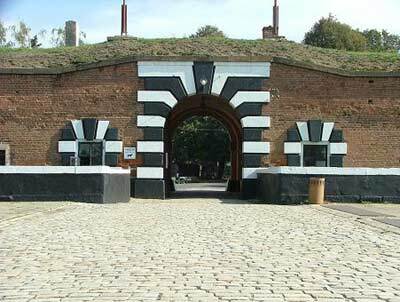 When the camp was liberated by the Soviet Army in May 1945, the fortress held almost 17000 prisoners. When you buy (the 200Kč combined pass for all monuments is good value) or present your ticket at the entrance office, you’ll receive a detailed brochure with a suggested walking tour. 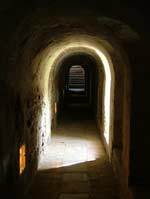 Following it will take you first through the prisoner’s area of the fortress. 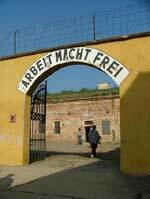 The barracks and cells in which they lived, the prison hospital, execution ground and mortuary, are all contained behind a gate inscribed with the slogan Arbeit Macht Frei (work makes you free). In this section you can also see Gavrilo Princip’s cell and a plaque describing him as a Serb national hero. Towards the end there’s a five-hundred metre section of tunnel to traverse, which if you manage to avoid the tour-groups who are bound to be exploring the fortress at the same time, is a silent, dim and eerie experience. Not least because just as you’re distancing yourself from the prisoners’ quarters and beginning to admire the structure and scale of the fortress and it’s suitability for it’s original purpose, the light at the end of the tunnel welcomes you to the execution ground and site of the mass graves which held the remains of around 10,000 people. From there you pass through the Gate of Death (in the opposite direction to the prisoners) and come to the part of the fortress that served the guards and commanders. Their quarters now house a cinema, exhibition space and the excellent and extensive museum that explains in detail prison life and history. The former officer’s canteen now houses a simple restaurant and if you can cope with the idea of taking your refreshment in the same place as some of the 20th century’s cruelest men, then it’s good to keep in mind, as you might need a break from the stark oppressive expanses of the fortress before plunging into the intense museum. 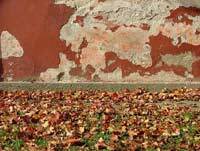 The museum deals exclusively with the Nazi era and is a must for any visit to Terezín. If you’re curious about the other history of the fortress there’s a small room of further exhibits directly opposite the cash desk at the entrance. There’s a good explanation of Gavrilo Princip’s place in world history, as well as banknotes issued for use within the camp and dozens of historic black and white photographs. Outside the entrance gate and bridge across the moat lies the national cemetery, where the bodily remains exhumed from the mass graves were reburied after the war. 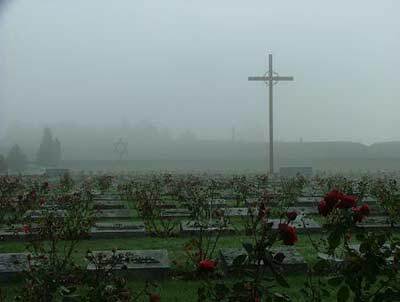 Red roses mark each one and the sheer number of graves reinforces the scale of the horrors that took place in the fortress prison. The footpath under the long alley of trees leads back towards the bus stop, the river, and the large fortress. It’s about a ten minute walk to the large fortress, which is a good chance to get some fresh air and remind yourself that things are much better now, at least in this part of the world.